Contact highly qualified lawyers from various businesses, industries, and law firms with the help of our Attorneys Email List! There are over 140,000+ legal firms with 1000+ lawyers across the globe. According to the American Bar Association, the number of active attorneys has increased by 15.2% since the past decade in the U.S. alone. Pitch any legal industry-focused products and services through our Lawyers Email Database. We at Blue Mail Media, helps you reach these professionals by providing reliable and human-verified Legal Practitioners Mailing List to the best use. Our Attorney Mailing List will bridge the gap and power your multi-channel marketing strategies flawlessly. Blue Mail Media’s Attorneys Email and Mailing List has been created based on data collected from authentic sources such as bar associations, court offices, law agencies, legal publications, and surveys. You can avail our pre-packaged Lawyers Mailing List or you can have your list customized based on your business and campaign specific objectives. Blue Mail Media’s well-established data partner network enables us to extend our services to the US, the UK, Canada, Europe, ASIA, Australia, New Zealand, Africa, Middle East, North America and South America. Also, our team of data scientists, analysts, and experts leave no stone unturned to keep our Database of Attorney Mailing Addresses updated with latest feeds by constantly verifying the accuracy of data and removing discrepancies. 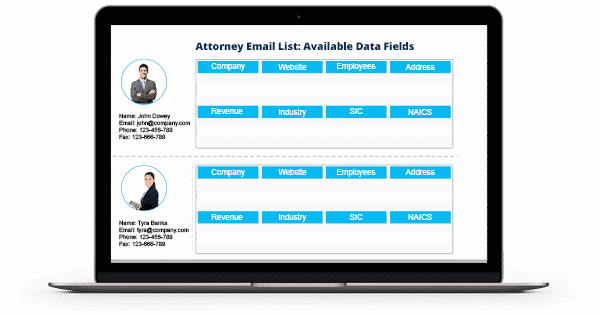 Our Lawyers Email Database provides complete marketing information including Name, Email, Title, Phone Number, Fax Number, Company, Web Address, Postal Address and Zip Code, SIC Code & NAICS Code. 1. How accurate is your Lawyer’s Email List? - Our Lawyer’s Email List is highly reliable as it provides 85-90% of accuracy and more than 90% deliverability rate. Our data experts and analysts make this possible by rigorously verifying the list and updating it continuously to keep it free from errors and duplications. 2. Does your Attorney’s List come with any customization option? - Yes. You can avail our Attorney’s Email List in a prepackaged or customized format based on your requirement. There are multiple selects available for customization option, including geographical location, SIC code, NAICS code, company’s revenue, job title, and many more. 3. Is it possible to target the global market using your Attorney’s Mailing List? - Yes. We make it easier for you to meet decision-makers and professionals in various regions across the globe with the help of our Lawyer’s Mailing List. The places we cover are - the US, the UK, North America, Canada, Europe, Australia, Middle East, South Africa, Asia, and many more. 4. How reliable is your Lawyer’s Email List? - You can fearlessly trust the information we offer in our Lawyer’s List because our team of experts gathers every single data from highly authentic and internationally trusted sources. It includes surveys, government records, corporate websites, trade shows, yellow pages, business directories, events, conferences, meetings, newsletters, campaigns, magazine subscriptions, and others. 5. What are the different data you offer in your Attorney’s Email Database? - Our Attorney’s List gives you access to all the essential B2B marketing information that is vital for successful campaign execution. The data includes- first name, last name, company name, job title, location, web address, mailing address, phone number, fax, email address, employee size, annual sales, revenue, SIC code, NAICS code, verification date, and some optional data such as social media profile, ownership type, and entity type. 6. Does your Lawyer’s List comply with GDPR and Anti-Spam law? - Yes. Our Lawyer’s Email List is crafted carefully to stay compliant with the guiding principles of GDPR and Anti-Spam law. 7. In which format will I receive my Attorney’s Mailing List? - After the completion of the payment procedure, we will send you the Attorney’s List in Microsoft Excel format via email.